Well it was a long time coming but on Saturday February 13th we moved into our kitchen. Key utensils, bags of saucepans and cans of miscellaneous grub were whisked from one end of the flat to the other as efficiently as we could manage. This all happened in a frantic rush after work as I simultaneously tried to clear an air lock in the central heating and cook a romantic Valentines meal. A candlelit food shoveling exercise followed while baby Beatrice balled away in her bouncy chair, making the most of the cavernous acoustics of the new room. Bliss! The weeks leading up to ‘the big move’ had proved full of ups and downs. 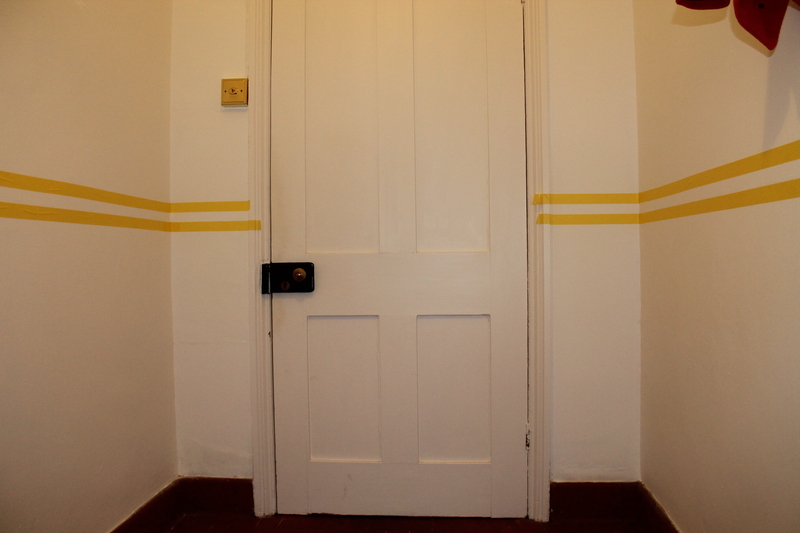 Our lavish plan of numerous bands of sweeping colour on the walls had been thwarted by paint adhesion failure (the low tack frog tape removed all paint back to the bare plaster even when only lightly applied). After much head scratching I opted for a simple two tone effect of grey and white. The black band provided by carefully stuck electrical tape running around the room! It sounds a bit Heath Robinson admittedly, but it’s actually quite effective and shows no signs of pealing some two months on. The severely damaged original floor is still in place and has been buffed, sealed and waxed within an inch of its life. Not that you’d notice, it’s still rather rough and ready, but exudes plenty of character. The gloss white kitchen units from Diy-Kitchens were delivered on time and proved extremely easy to fit together. I wrestled with kick boards, handles and the integrated dishwasher but ultimately emerged victorious. The ‘Maron Jupiter’ (dark brown) quartz worktop arrived a couple of weeks later and was swiftly fitted by the suppliers, Natural Stone. Last job was a spot of tiling. The choice of a combination of large slabs of gloss black with mosaic counterparts on top was a last minute decision but proved fairly quick and easy for the enthusiastic amateur to fit. I personally think the final result looks rather nifty, if perhaps a bit more 21stC modern than 20thC Modernist. Above the mighty fireplace hangs a modern deco-inspired beveled mirror mounted on an angle so that you can see yourself stood in the room below. 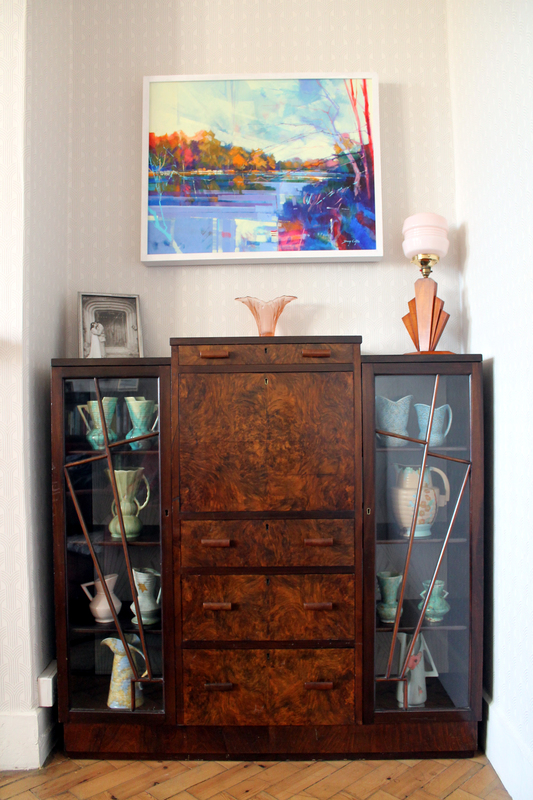 The beautiful veneered larder is a tall boy I managed to extract from a full suite advertised on ebay. The clothes rail was removed, shelves fitted, a charity shop spice rack hung on the inside door and obligatory Robertson’s Golly Enamel attached to the other. The delightful table and chairs are were a donation from my aunt and uncle. This original mid 30s ‘magi-cube’ set was the very same suite that my mother dined at as a child. A light sanding and varnish plus new seat coverings were all it needed to restore it to its former glory. In one last act of total indulgence we treated ourselves to a new fridge, toaster, kettle and microwave all in gloss white. But what should we sit our precious new Akai microwave on? The plan was always to have it separate from the worktops next to the fridge. The answer presented itself on Valentines day as we strolled around the huge Malvern Flea Fair. A totally dilapidated early Bush television (Some later internet investigation dated to 1951) presented itself with a £20 price tag. It quickly found its way into my workshop and 7 days later I’d sanded, varnished and moved the rather heavy fellow into its new home. So 12 months in the planning and about 5 in the making we’ve got ourselves a splendid room the whole family are in love with. The only problem now is my lack of motivation for converting the old kitchen into Dorothy’s new bedroom! In my world, the winter is for interior design stuff and the summer is for playing with old cars.. the summer is on its way so I better get a wriggle on! 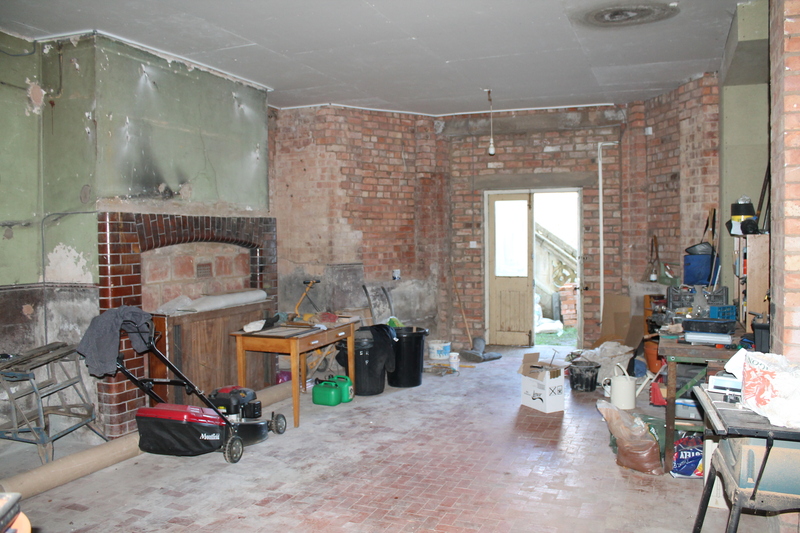 Earlier in the year I published a few posts concerning a significant reshuffle of our home layout; ultimately leading to us creating a kitchen/diner at the opposite end of our garden flat (the existing kitchen then being converted to a bedroom/nursery for our new edition ‘Beatrice’). The summer months yielded hardly any progress thanks to unreliable tradesmen. By September, in a fit of frustration we changed contractors and have watched things progress at rapid speed since then. 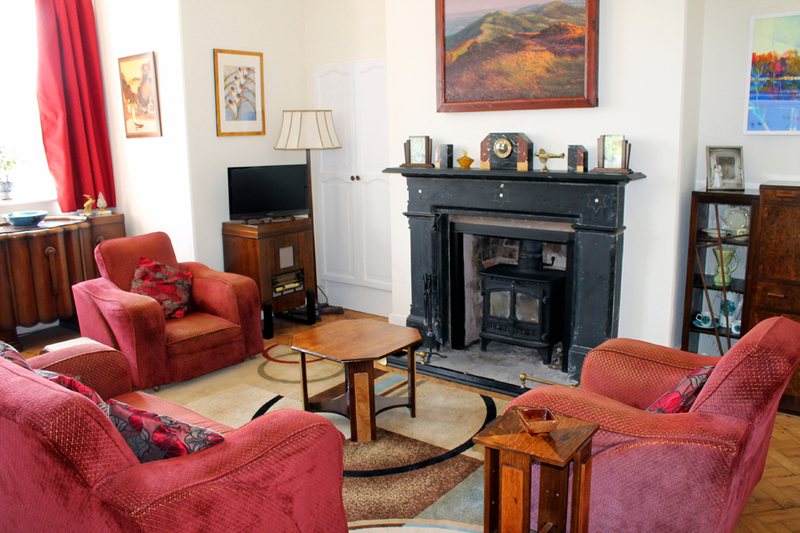 The flat sits within a large 1860s property, but with the new project we have completely disregarded all rules of period correctness and have heavily indulged our interwar design fantasies. 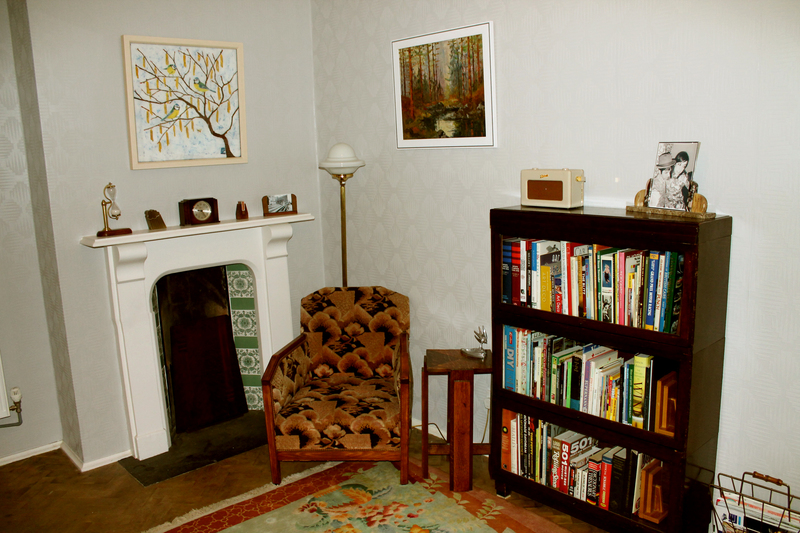 The room is a very generous space, but is not without its problems. The walls were a mixture of bare brick and crumbling plaster, with numerous steel pipe brackets seemly growing like grass out of the walls. The original Victorian terracotta tile floor (which runs throughout most of the flat) was very dirty and poorly repaired with concrete in places. The high ceilings gave little heat or acoustic insulation from the heavy footed residents upstairs, and there was little to no natural light. November – battening and joists going in. To counteract these we fitted a false ceiling crammed with rockwool, batton and boarded all the walls, knocked out a bricked up window and fitted a double glazed sash, and gave the floor some much needed TLC repairing the damaged sections with coloured cement and buffing the whole thing. All wiring and pipework has neatly been hidden behind the new walls and ceiling. After much searching and deliberation I had to abandon my hunt for lights that mimic those in the Cafe Zedel (see my previous blog) and do the obvious thing, ship a bunch of matching reproduction light fittings from Australia! 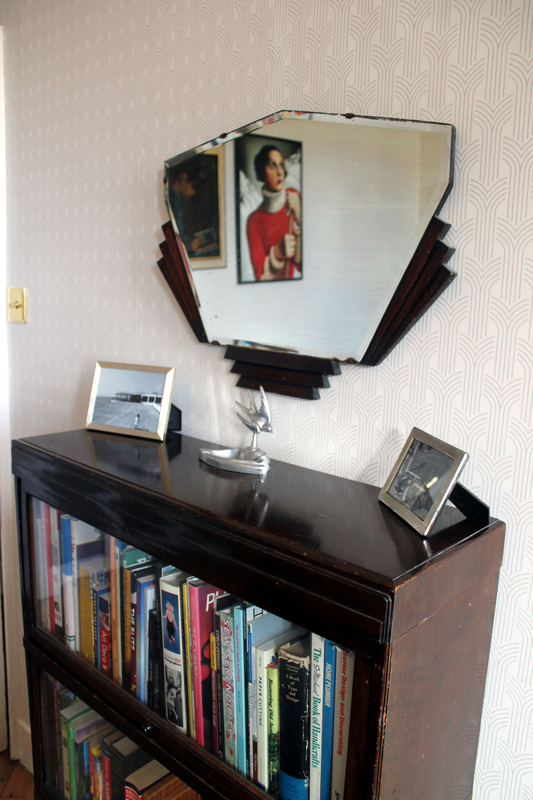 I would have loved to use original period fittings, but finding items that matched in our chosen chrome scheme was near impossible. So in one of the most extravagant & indulgent purchases I’ve ever made I found myself placing an order for some beautiful wares at Restoration Online. A three branch chandelier, large pendant and two wall lights from the Astoria range found themselves heading in my direction, arriving with a nasty customs bill to keep them company. They’ll be mounted on ‘Miami’ roses from Classic Ceiling and should look fantastic. The kitchen units are on order from DIYkitchens and should arrive early in the new year. We’ve gone for a fairly predictable (but thoroughly appropriate) curved white high gloss ‘Livorna’ range with rusty black quartz worktop and bow handles. Between now and then I’ve got to paint the room. After dismissing large blocks of green in our original plan as being too imposing we’ve opted for a more radical scheme. Thick bands of white, grey and ‘twisted turquoise’ with a 30mm black line will run from the worktop around the whole space. 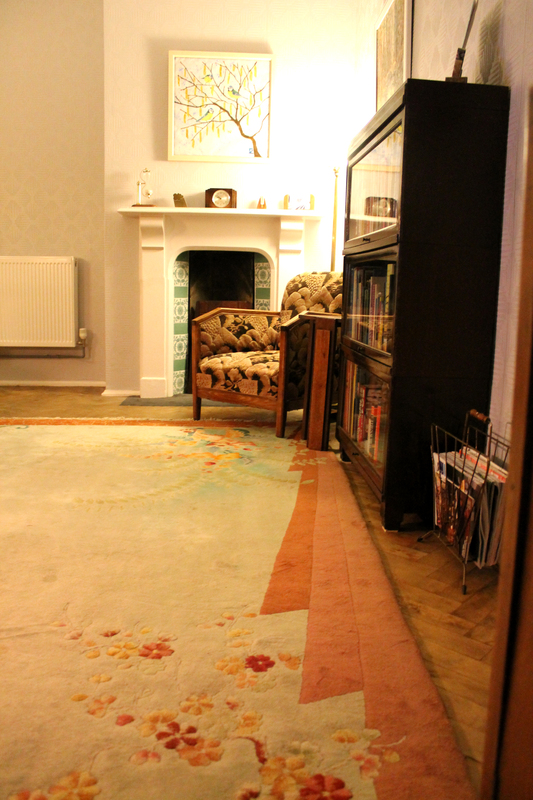 The turquoise will stay 300mm from the black line, but climb up and over doorways and other features. It’ll test my frogtape abilities to the max, but should hopefully be worth the trouble and strife in the long run. In the hunt for beautiful Art Deco features to add to our current kitchen renovation project I stumbled across the fantastic Birmingham based firm Classic Ceilings. This small enterprise run by Marc Newey creates high quality period plaster ceiling roses, coving corners, overdoors, light switch surrounds and air bricks. He personally designs and manufactures pieces in Arts & Crafts and English & French Revival styles, but its his love for Art Deco that made my jaw drop. His attention to detail and eye for multi layered design really captures the period beautifully and the execution is perfect. Just browsing the site gave me a deep yearning to be renovating a modernist interwar property. Sadly there’s no sign of that opportunity presenting itself in the near future, so until then I’ll make do with my current project. 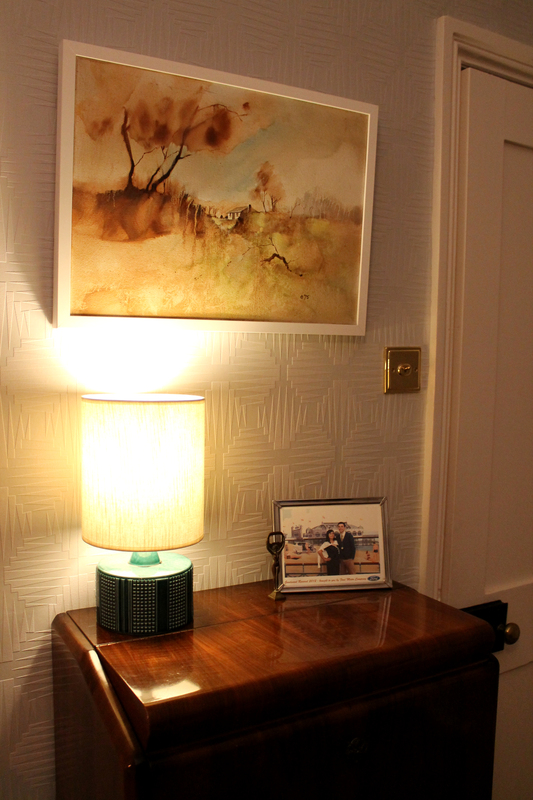 Marc has supplied me a ‘Sunstorm’ vent cover which I’ve installed over an airbrick on a chimney breast, and two ‘Miami’ ceiling roses that echo the appearance of an old cinema clock that will hang at one of the room. So the mammoth reorganistion of our home is starting to gather some steam now as we slowly enter the exciting kitchen design phase. The generously proportioned room is nearly empty and ready for work to commence, which means we really need to finalise the layout and start investigating some of the finer details such as lighting. The room itself is a long dark space, hidden mainly underground with a french doors at one end and one (yet to be reinstated) single pain window. As such, artificial lighting is gonna play an important part in rendering the room a pleasant place to inhabit. Despite the fact it’s a Victorian building, we’ve decided to follow our hearts and create a clean, crisp modernist kitchen with a strong 1930s influence. So where does one start with lighting? My wife and I recently had the pleasure of a weekend away in the big smoke while the little one enjoyed some quality time with granny. Amongst the action packed itinerary was a meal in the jaw dropping surroundings of Brasserie Zedel, a French Restaurant in Piccadilly. 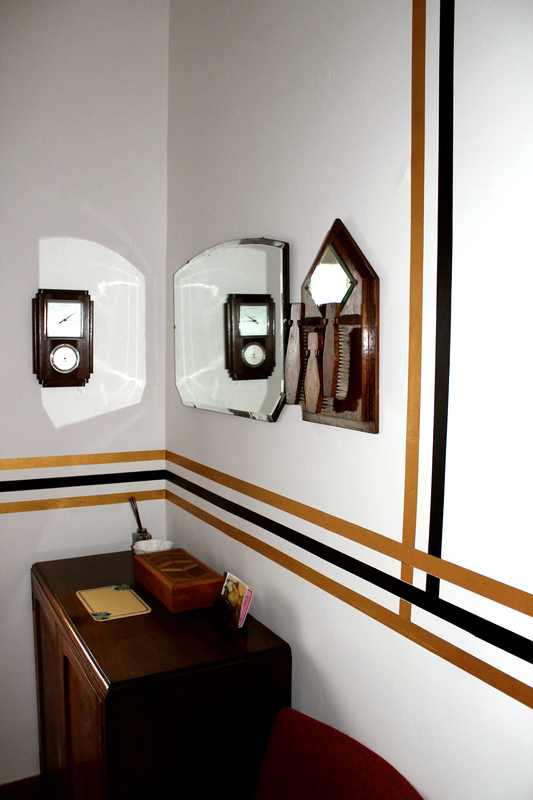 Anyone with even a casual interest in Art Deco needs to put this on their bucket list. Wander through the quaint street level cafe to the stairs at the rear and you’re already picking out exciting details. Wallpaper, mirrors, posters all hint at whats to come. As you descend into the lower hall it becomes clear that this really is a subterranean inter-war wonderland. ‘Bar Americian’ is a sumptuous dimly lit lounge with an aviation theme. Thick ribbons of dark wood veneers are spliced with brass geometric banding that span the whole room. Illuminated column mounted glass discs and innovative bar lighting bathe the room in a warm glow that creates such an intoxicating environment its hard to tear yourself away. But leave we had to, as our table in the adjacent Brasserie was ready.. The restaurant is located in marble clad hall that’s a total contrast to the dreamy atmosphere of the bar. Originally part of the Regent Palace Hotel, it was opened in 1915 exhibiting the ‘opulence and scale of a transatlantic liner’. The ghost of this Edwardian extravagance is still clearly visible today , but in the early 1930s Oliver Percy Bernard was commissioned to redesign the interior of the hotel with a more contemporary feel. The brasserie retains many of these upgrades, giving a perfect blend eras. As I sat at our table drinking in both my surroundings and a splendid glass of Corbières, my eyes kept returning to one thing; the stunning ceiling lights. Huge slabs of opaque glass strapped together in a brass cage, all suspended on four rigid legs. Perfect for a kitchen renovation thought I! Cursory searches for something in a similar vein didn’t prove all that fruitful. 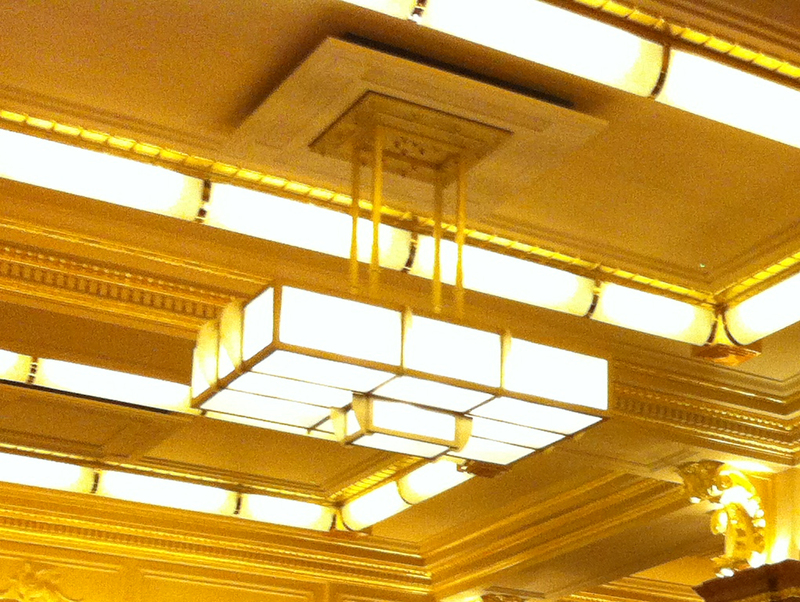 There doesn’t seem to be many ‘off the peg’ large Art Deco ceiling lights available in England.. wonder why?! One rather fetching option I unearthed named the Odeon Plafonnier looked ideal until I inquired about the price (I won’t say how much, but lets just say I burst out laughing on receiving the quote!). Some Chinese manufacturers list fittings that might be ok, but are likely to be of dubious quality. The best option so far is this one from the States.. problem is their mains power runs at 110V, less than half of that in the UK. I need to investigate further, but light fittings are fairly easy to rewire, and priced at about 5% of the Odeon it looks like a strong possibility. 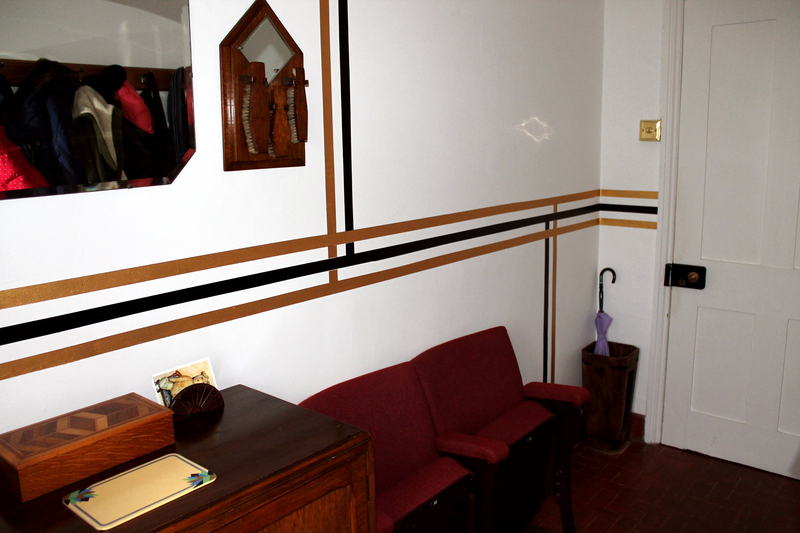 If there’s better way to spend down time during the festive season than painting lines on a wall, then I’m not aware of it! 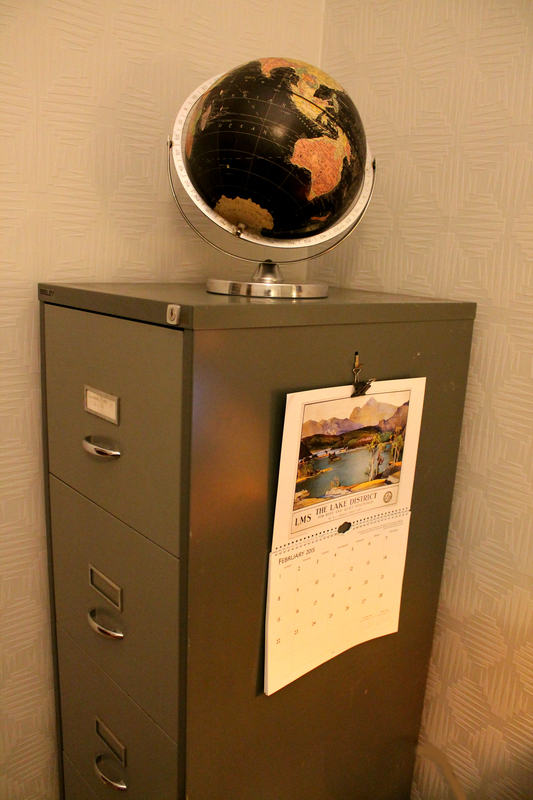 The inspiration for this genius idea came from a photo of the inside of the ‘watch room’ at Duxford Air Base. A broad grey stripe sweeps around the entire room, echoing the runway it overlooks. The Watch Office, the forerunner to the Control Tower, as it might have been during the late 1930s. Alas, I don’t have a watch room, but I do have a porch that was in need of a bit of a spruce up. 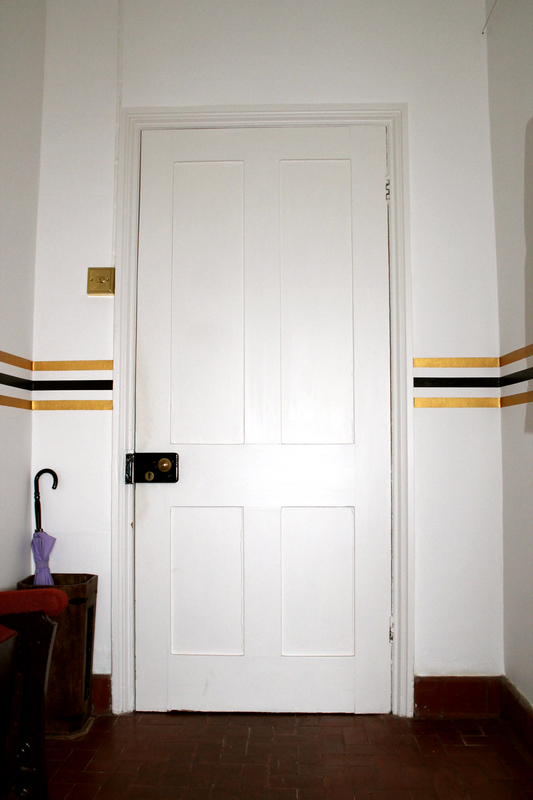 A splash of white on the walls provided a good base for some masking tape based experimentation. With the help of a laser level I taped a border around the whole room, then another, and then another (lines – they’re a bit moreish). After some photoshop mock ups, a black and gold colour scheme was decided on and several coats of acrylic paint were duly rolled on. 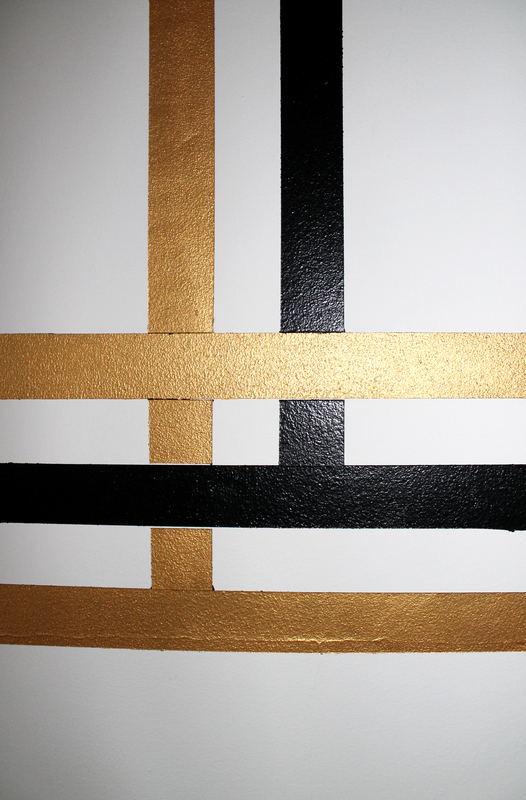 I was reliably informed that black is a good undercoat for gold paint, giving a deep bright shine. Good advice it would seem. On removing the tape I was so darn pleased with the effect I threw caution to the wind and painted some intersecting verticals in celebration. The finished product evokes thoughts of vintage railway carriage livery, or perhaps a more glitzy section (I refuse to use the word ‘bling’) of a London Underground map. The icing on the cake was to replace the standard pendant light fitting with a reproduction Bakelite job and throw down a new rug. One revamped porch, done! What a fine place to remove ones shoes, even if I do say so myself. 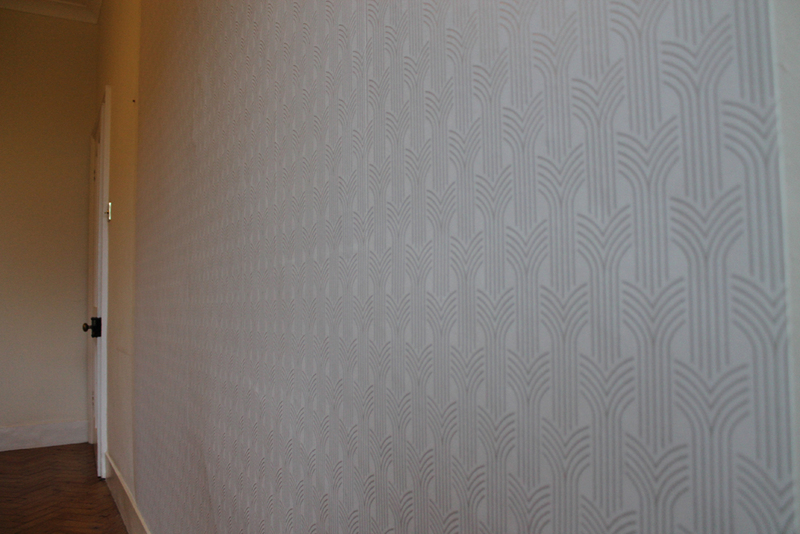 After two weeks of evenings spent scaling the heady heights of our lounge on a wobbly ladder we have completion in the Graham & Brown Cinema wallpaper project. It’s subtle but very effective, even if it doesn’t exactly dazzle in the photos. Pattern matching in the corners wasn’t even remotely easy considering the uneven nature of our aged walls, but as long as you don’t look too closely.. it’s passable. Tonight I find myself at the top of a ladder trying to hang some wallpaper in the lounge. It’s going relatively we’ll, but my paste covered fingers are struggling to grip the shiny surface to ensure perfect pattern match. “I don’t remember it being this blimin’ tricky” I yell down to Tash who’s hovering with tea, brownies and encouragement, but even after two lengths, I can tell it’s going to be worth the strife. Until now we’ve had perfectly serviceable walls dressed in a matt emulsion called ‘vintage white’. A generous assortment of paintings cheered up the blank slabs and injected welcome bursts of colour. 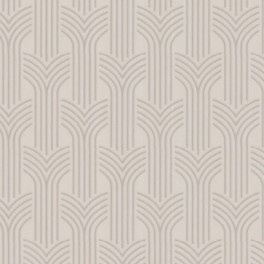 We had no reason to alter this happy arrangement until I became aware of the ‘Cinema’ range of wallpapers from Graham & Brown. In the past I’ve occasionally stumbled across some 30s or deco influenced papers, but they’re usually either pretty naff with excess glitter that rubs off with the lightest of touches, or full on 30’s reprints that tend to look a bit oppressive and loud. A sample in cream and gold was duly ordered, and it became clear that this was a bit of winner. 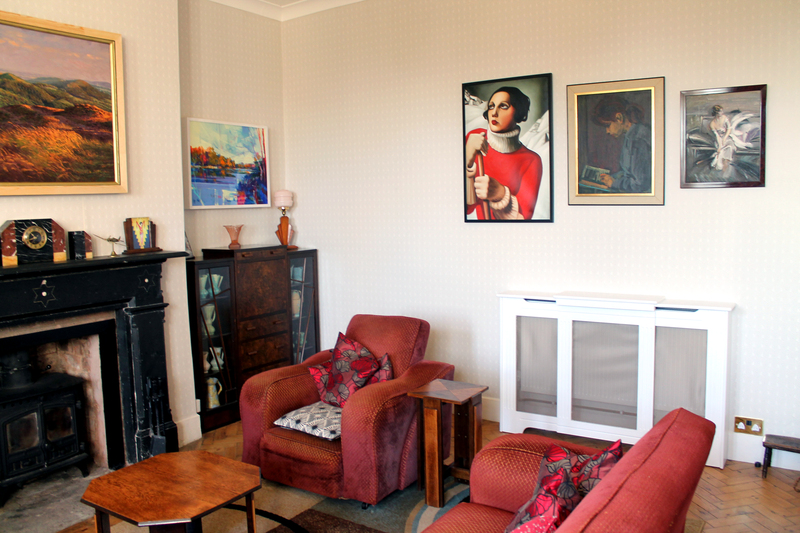 We could add a touch of silver screen glamour to our lives, and cover the whole living room for less than £200. It’s a superfresco vinyl paper, so slightly embossed and pretty easy to work with. It also means you can paste the wall rather than the paper, which is new to me (but seems to work OK). So here I am trying to hang the stuff… Which may take several evenings, but will hopefully be well worth it. Out with the new, in with old. 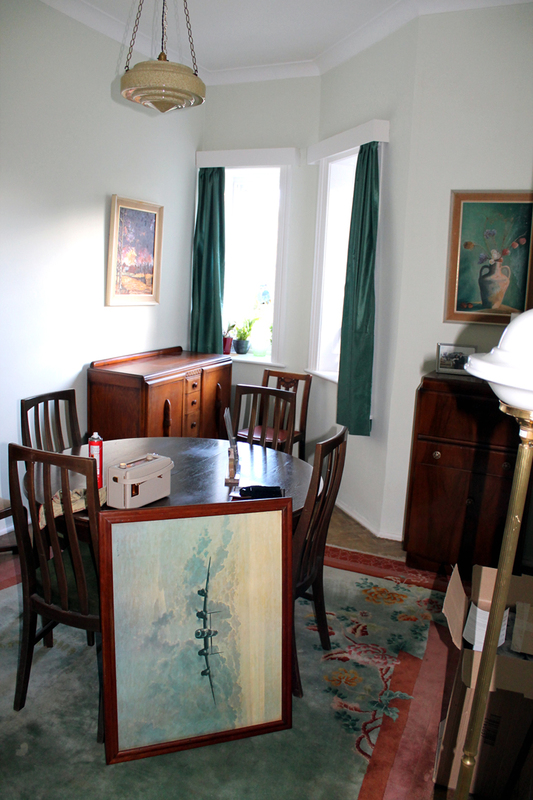 Having spent the last 4 or so years filling our humble home with items from (or inspired by) the designs of the inter-war years, we’ve got a fairly sizable assortment of bits and bobs. Each new purchase brings another room one step closer to the film set perfection I’m aiming for. But like the elusive pot of gold at the end of the rainbow, with each step forward, the final goal seems to move further away.. which is probably why I enjoy it so much. It’s a life’s ambition! The latest thing on my want list was a suitably period light fitting for our lounge. Until now I had shied away from collecting anything that could be called a fixture or fitting as I’ve never been that comfortable with the idea of installing 1930s modernism in our 1860s flat.. but I couldn’t live with that ‘traditional’ B&Q chandelier in our lounge any more.. so the quest for a new light fitting was on. A large quantity of the stuff I buy is from ebay; OK it’s not the most romantic way of shopping. No trawling through the basements of dusty antique shops or haggling with wheeler dealers at the local flea fair, but with an 18 month old in tow most of the time its an easy way of satisfying my decoholic obsession. On this occasion I found what I was looking for fairly quickly. 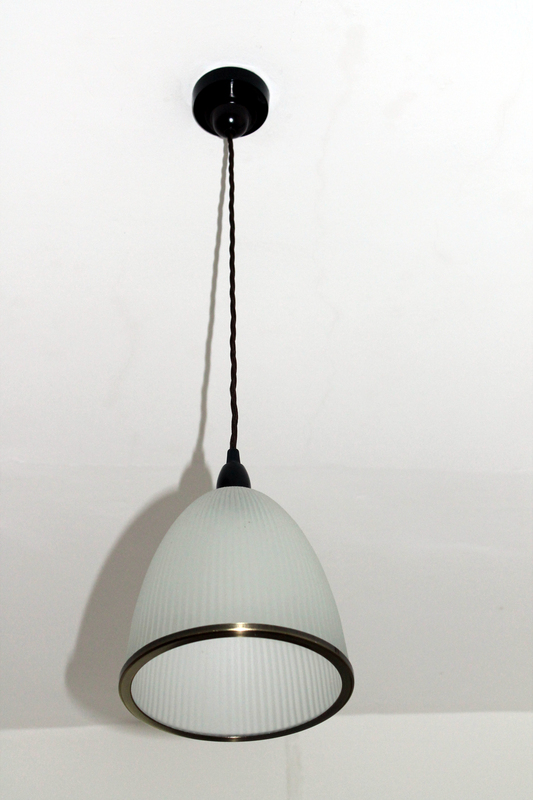 Multiple lights on a brass frame with some simple yet bold glass shades. To be honest I’m not 100% sure this is from the 30s, more likely early 50s (the little red ball finial looks particularly mid-century to me), but never the less, it’s a smashing addition and me and the Mrs are dead pleased with it. Before & After – A justified upgrade!